. :: Welcome to Mother Teresa College of Education :: History ::. Mother Teresa College of Education is situated in the midst of Greenland surrounded by the beauty of Nature. It is also beside the Pudukkottai and Dindigul Highways. Mother Teresa College Education was started during the year 2005-2006 for the benefits of the young and budding students not only from Pudukkotta in District, but also from the neighboring districts of TamilNadu. Its main aim is to cater to the needs of rural areas, without discrimination caste colour and religion. The college is recognized by NCTE (F.SRO/NCTE/B.Ed/2005-06/1581 Date:06.07.2005) and affiliated to the TamilNadu Teachers Education University, Chennai (B.Ed/M.Ed: TNTEU/R/Affln-Contn/2009-2010/1954 Date: 16.11.2009) Courses offered by the college are B.Ed (Bachelor of Education) for 100 students, with one year duration and M.Ed (Master of Education) for 35 students with one year duration recognized by NCTE (F.SRO/NCTE/M.ED/2006-07/8983 Date:08.11.2006). Illuppur is a small village in Pudukkottai District where farming is the prime occupation of the people and another major occupation of the people is artificial gem cutting. Considering the importance of a College of Education to cater the needs of the poor people of the locality and also for urban poor, Shri. R. Chinnathambi started Mother Teresa College of Education at Mettusalai, Illupur (Tk), Pudukkottai (Dt.) in the year 2005. It's involvement is not an exaggeration to say that Shri. R. Chinnathambi, who is deeply engrossed and assimilated with the thoughts and ideologies of Mother Teresa, who was a great saint and also a great humanist and Nobel Laureate, christened the institution after her name. India, being a poor country, and most of the students in Indian schools are poor, the institution felt that only teachers from poor economic background stand to feel the exact aspirations of the poor students and thus, emerged as a great this institution which aims to give opportunities to the poor students of rural and urban to achieve the excellence in learning . Apart from promoting the poor students to achieve excellence in teaching, Mother Teresa College of Education is aiming at imparting and sustaining the human values in their students who would make a society to lead a harmonious life. 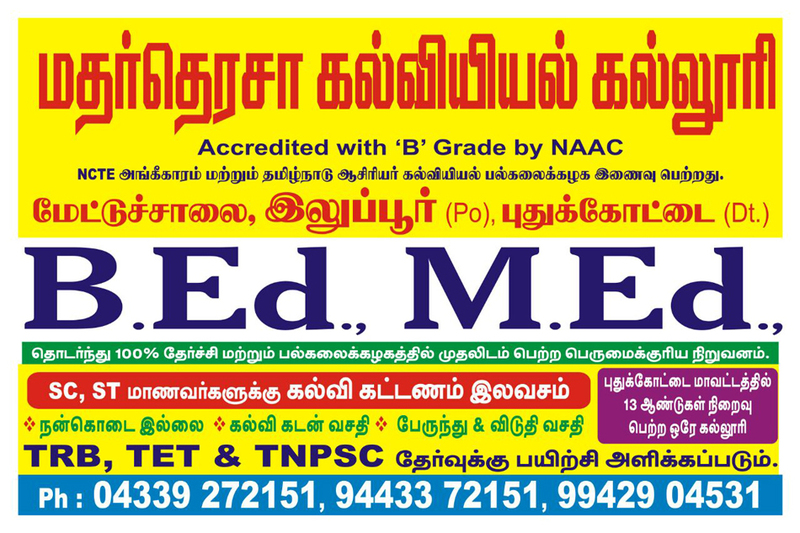 This college is affiliated to Tamil Nadu Teachers Education University, Chennai. NCTE has accorded permission to run M.Ed., course from 2006-2007 academic year onwards.